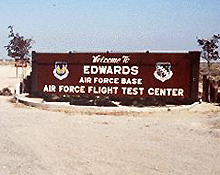 Edwards Air Force Base is home to the Air Force Flight Test Center. Edwards AFB, in the western portion of the Mojave Desert, is 100 miles northeast of Los Angeles and is ideally located for shopping, sightseeing and recreational activities. The military base began as a stark and remote bombing range in 1933 and went on to become a major bomber training base in World War II. The Air Force Flight Test Center originated during the darkest days of the war, and has since achieved more major milestones in flight than anywhere else in the world.